Warren’s Jordan Sitler (7) puts down a kill between Central Valley’s Dana Bartoletta (9) and Hannah Engelman (20) during the first set of their first round match in the PIAA state tournament at Meadville High School, Tuesday, Nov. 6, 2018. Sitler finished with a career high 12 kills to help lead the Dragons to a sweep of the Warriors and a quarterfinal matchup with Thomas Jefferson Saturday. MEADVILLE, Pa. – The physical surroundings were quite familiar, but the experience was entirely new for the Warren volleyball team Tuesday. That might explain why it took the Dragons a few points to get settled in, but once they found their rhythm, they did what they have done virtually all season long. Warren swept Central Valley in the first round of the PIAA 3A state tournament in the ‘House of Thrills’ at Meadville High School, 25-20-25-15, 25-17. The Warriors (14-5) got out to a 7-2 lead to start the match, and despite some big kills from Lydia Latimer and Ellie Lobdell, the Dragons were unable to get a sustained run going. 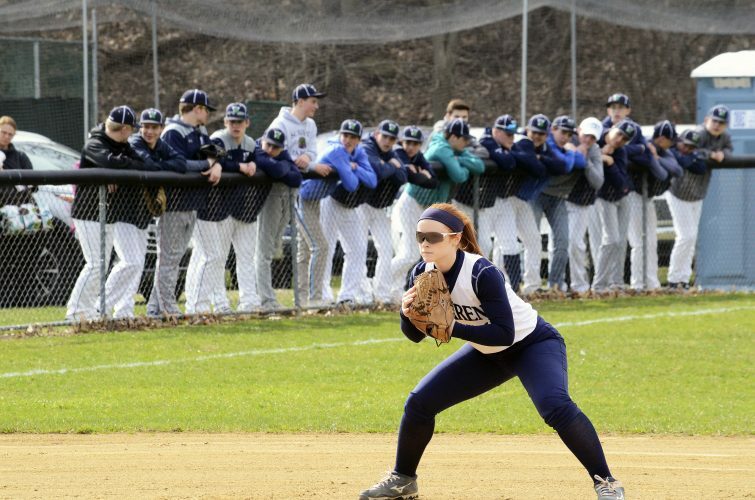 CV continued to build momentum, getting out to an 11-5 advantage. A Lobdell cross-court kill started a 4-0 run for the Dragons to pull them within two at 11-9. The teams traded a pair of service errors and a Jordan Sitler kill tied the set at 14. Warren’s Julia Lobdell (1) receives a serve during a PIAA first round match against Central Valley at Meadville High School, Tuesday, Nov. 6, 2018. 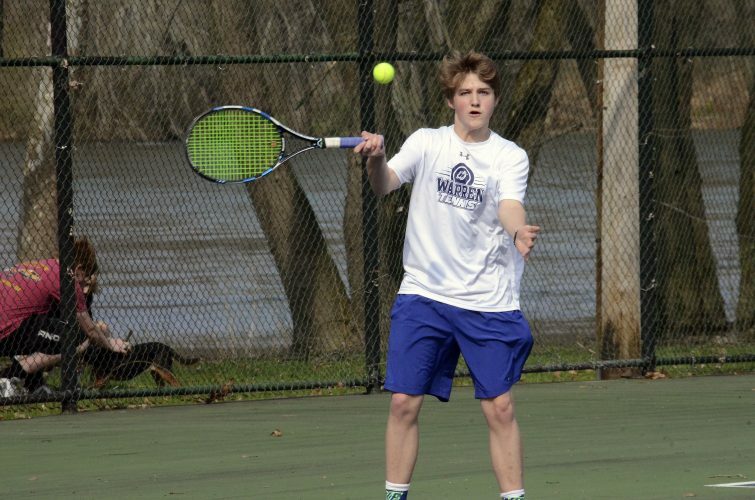 Lobdell and the Dragons swept the Warriors and will now face Thomas Jefferson in the quarterfinals Saturday, time and location to be determined. The Dragons took their first lead of the match on the next point. The Warriors came back to tie things at 16-16, but Celia Chase put a big swing on the ball to regain the Warren advantage. Another Lobdell kill put Warren ahead 20-17. A long volley ensued on the next point and the Dragons got three key saves out of their back row to keep the ball alive long enough for Sitler to put it down and stake them to a 21-17 advantage. A Latimer block had Warren at set point, 24-19, and she finished off the set two serves later with a mighty kill for a 25-20 win. Warren carried the momentum over to the second and raced out to a 7-2 advantage. CV got a couple points back, but a long volley with multiple saves from both teams ended with a Latimer kill and a 10-4 Dragons lead. Chase hit back-to-back kills to push the score to 12-4. 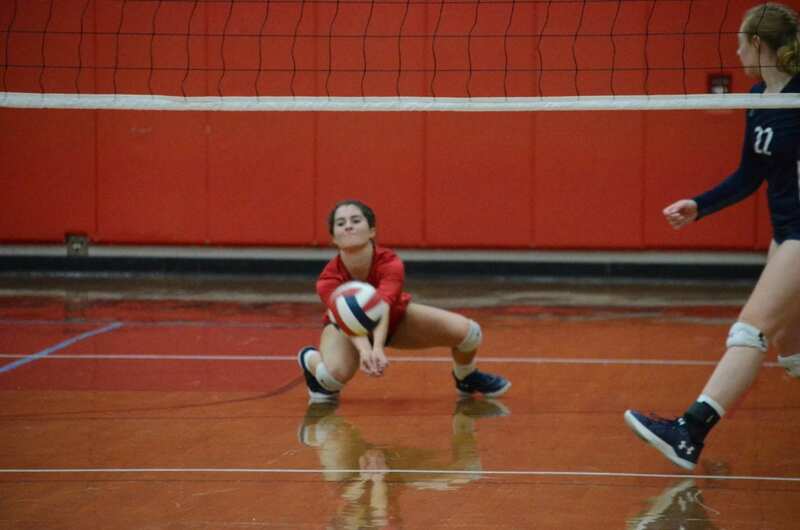 The Warriors got the next point, and Natalie Mowad stepped to the service line. She rattled off four straight aces to get CV within three at 12-9. The Warriors got to 12-10 after their 6-0 run, but the Dragons answered right back. Latimer and Sitler hit consecutive kills to regain the four point advantage, then Chase hit two more back-to-back to make it 16-10. A service error ended the Warren run, but another Sitler kill made it 18-11. 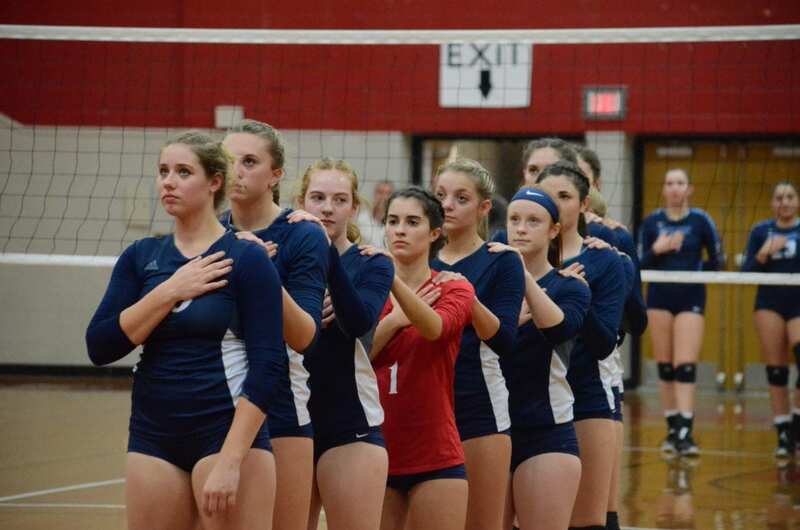 Warren volleyball team members stand during the playing of the national anthem prior to their PIAA first round match against Central Valley at Meadville High School, Tuesday, Nov. 6, 2018. 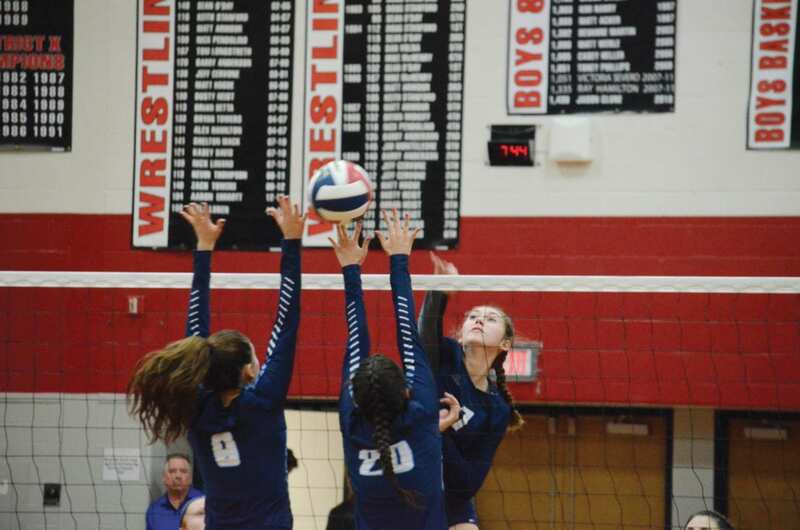 Most of Sitler’s kills in the set came by way of ball placement instead of using pure power, something the sophomore said has been a work in progress. “I’m learning to go around the blocks now,” Sitler said. An Ellie Lobdell kill made it 21-13 and Julia Lobdell’s ace pushed the lead to 23-13. The Dragons got to set point at 24-14, but CV answered with a kill. On the next serve, Nyquist sent the ball to Latimer who put it down to give the Dragons a 25-15 second set win and a 2-0 match advantage. The teams traded points through the early part of the third. Warren was getting big swings from Latimer, Sitler and Chase, but couldn’t quite put together a sustained run. A Sitler kill put them ahead 7-5, and the Dragons took the next three points to force a Warriors timeout with Warren leading 10-5. CV battled back, but Warren was able to do just enough to keep the Warriors at bay. A pair of Latimer tips pushed the Dragons lead to 18-12. From left, Warren’s Trinity Wennberg, Ellie Lobdell, Lydia Latimer, Celia Chase and the rest of their teammates are greeted in the halls by their fellow classmates at the end of the school day on Tuesday in a special send-off before their state playoff opener. The long volley on the next point went in the Warriors’ favor, but an error on the ensuing serve halted any momentum they hoped to build. Sitler came up with a kill to make it 22-14 in Warren’s favor, but another Nadia Mowad ace gave the Warriors life, trailing 22-16. Mowad hit the next serve into the net and Warren got match point at 24-16. CV hung tough and took a point, but Sitler ended the game with her 12th kill to send the Dragons on to the quarterfinals. The confidence showed through Tuesday as Sitler connected on 12 kills in 13 attacks for a 92.3 hitting percentage. She was one of three Dragons in double figures for kills. Latimer led with 13, while Chase had 10. Latimer added five blocks and 19 digs while Chase had a block and nine digs. Ellie Lobdell added seven kills and 15 digs, with Grace Wortman getting 15 digs, three kills and three blocks and Julia Lobdell adding eight digs and the Dragons’ only two aces. Nyquist added five digs and 41 assists in the win. 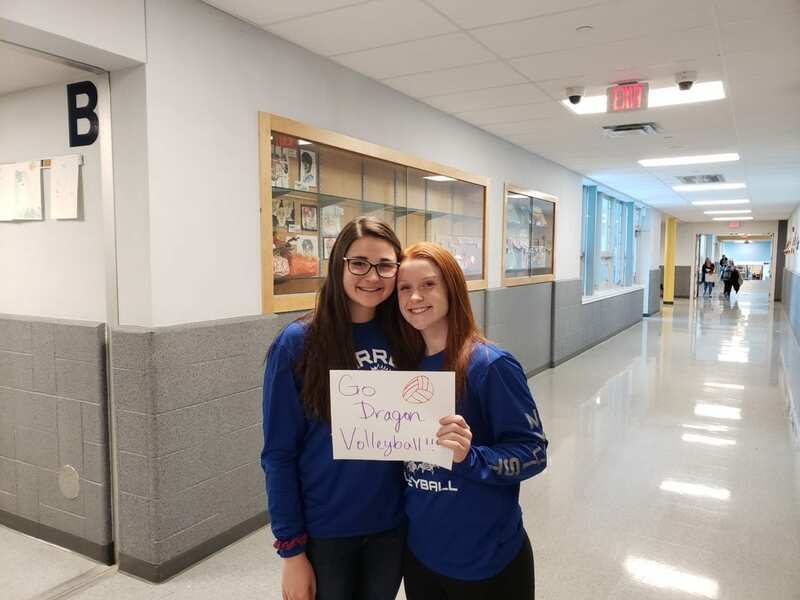 Warren’s Grace Wortman and Lex Nyquist stop for a picture holding a ‘Go Dragon Volleyball’ sign before they are greeted by their fellow students at the end of the school day on Tuesday, before departing for Meadville. Warren will play in the quarterfinals on Saturday against Thomas Jefferson (a 3-0 winner over DuBois Tuesday), with the time and location to be determined. Even though they’ll have to face another unfamiliar opponent, Dolan said he doesn’t expect much to change in his team’s preparation.